Home > News > Stewart Bell’s “The Cupboard Of Fear” Storybook Re-issue – OUT NOW!! 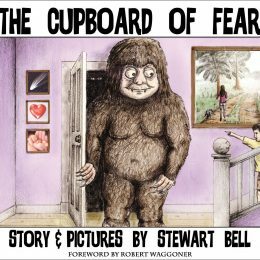 Stewart Bell’s “The Cupboard Of Fear” Storybook Re-issue – OUT NOW!! By Stewart Bell (Foreword by Robert Waggoner) – A storybook aimed at helping children (and adults!) to overcome their nightmares by teaching them how to lucid dream. The story is based on my own experience at 6 years old and tells how a recurring nightmare I had as a child – about a monster living in the cupboard at the bottom of the stairs – prompted my older brother to teach me how to become aware while I was dreaming and then, how to face up to the monster from within the dream. The book has a foreword by renowned international speaker and author on lucid dreaming, Robert Waggoner and also contains a handy guide on how to master your own dreams. To order the story book click here. A larger deluxe version of the storybook – with your name and town printed in a “special thanks to” section plus a photo of your choice included in the story as a picture on the wall – is available on my Learn To Lucid Dream website, click here. Each storybook comes with a personal dedication of your choice by the author. Lucid Dreaming Tools/ Merch – tools to help you lucid dream, themed around the most effective lucid dream induction exercise; a Reality Check. Please click here to order your reality check tools from my lucid dreaming site.